When the conservation season first started, the sounds on the market were terrible. 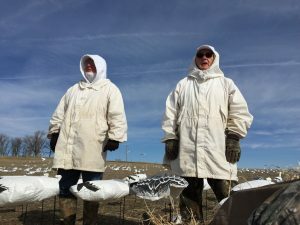 But the snow geese had never heard an e-caller before and they worked well. Eventually crystal clear sounds hit the market like our SnowTalker recordings and hunters were able to crank up there e-callers to incredible volume before distortion. In those early years, the louder you cranked the tunes the more geese you pulled. 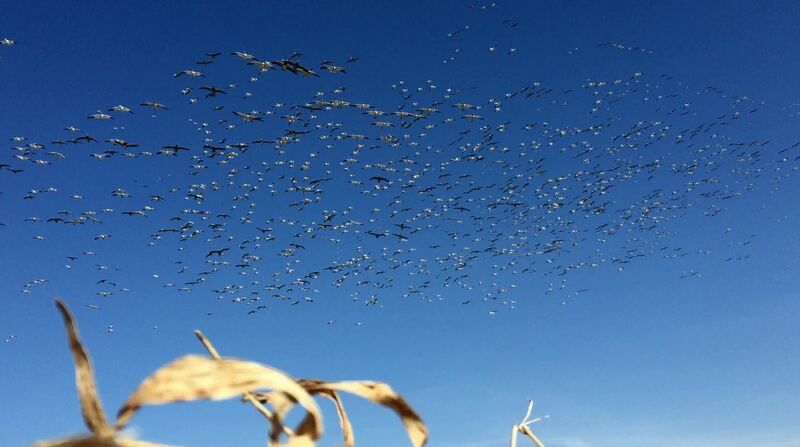 The geese are much smarter and hunters are also. In terms of e-callers this means the days of blasting them ultra loud are over. To be succesful today you need to match your volume level to the situation you are hunting that day with extra attention paid to how strong the wind it. Below are some rules you can use for setting your e-caller each morning. Always have atleast one speaker pointed in the exact direction you expect the geese to finish. The geese will finish into the sounds. If running only one ecaller opt for a 4 speaker unit. Place the one speaker in the direction noted above and the other three in a peace sign at 45 degree angles (more if the geese are way up high that day) so you have 360 sound coverage as the geese circle your spread. If running multiple e-callers, place the volume level of any units on the down wind side of your spread at a lower volume level. You want the most volume where you want the geese to finish. Day in and day out feeder sounds like our Snow Talker feeding recordings should be your go to sound track. The exception to this is on high wind days. See below. On very high wind days, place your e-caller speakers and motion decoys on your upwind side of the spread and play flying sounds like our Snow Talker flying sounds and sit on the down wind side of your decoys. 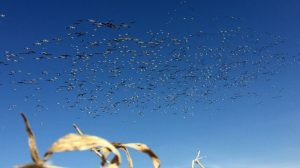 The high pitched flying sound will cut through the wind better like a highball on a duck call and you will shoot the geese as they crawl up and over your decoy set as they fight the high wind. Your go to volume level should be roughly as loud as the geese are when they are 200 or so yards away. You can play with the volume level but I lean toward quieter these days. If the lord above blesses you with a monster pocket of juvies that are bareling into your spread all day, don’t be afraid to crank up the volume for more attraction power. Just be careful of this on front end or mid migration birds as it will hurt you much more than it will help.